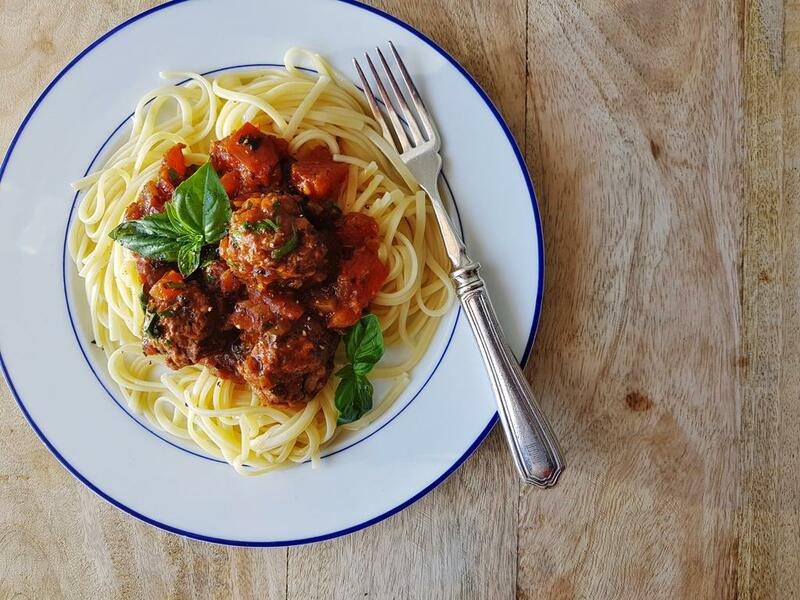 Veggie spaghetti, topped with saucy meatballs, fresh basil and chilli. Meatballs: Season the mince generously with salt and pepper, then mix in HALF the parsley and HALF the onion. Use your hands to shape the mixture into golf ball sized meatballs. Place a large saucepan on medium-high heat with a drizzle of olive oil. When hot, place the meatballs into the pan and cook for 3 minutes, moving them around to make sure they brown all over. Set aside. Tomato sauce: Use the same pan you used for the meatballs, discard SOME of the fat and place the pan on medium-high heat. Add the REST of the onion with a little salt and cook for 5 minutes. Add garlic, tomato paste and oregano and cook for 30 seconds before adding the tomatoes and the water (see quantity above for the tomato sauce). Season with salt and pepper and cook for 7 minutes until the tomatoes soften and the sauce thickens. Add the meatballs back into the pan with the REST of the parsley. Gently cover the meatballs with the tomato sauce, making sure not to break them up. Add another splash of water (if necessary) to loosen the sauce. Cook for another 7 minutes until the meatballs are cooked through. Veggie noodles: Boil the kettle. Place a saucepan on medium-high heat and add the boiling water. Add the veggie noodles and cook for 1-2 minutes until cooked, but with a slight bite. Drain in a colander and sprinkle with a little olive oil to keep the noodles from sticking together. Serve the saucy meatballs with the veggie noodles and top with the torn basil leaves and chilli (optional). "Loved this classic!! Vegi-noodles are delicious!!" "great family meal , we all enjoyed this one. 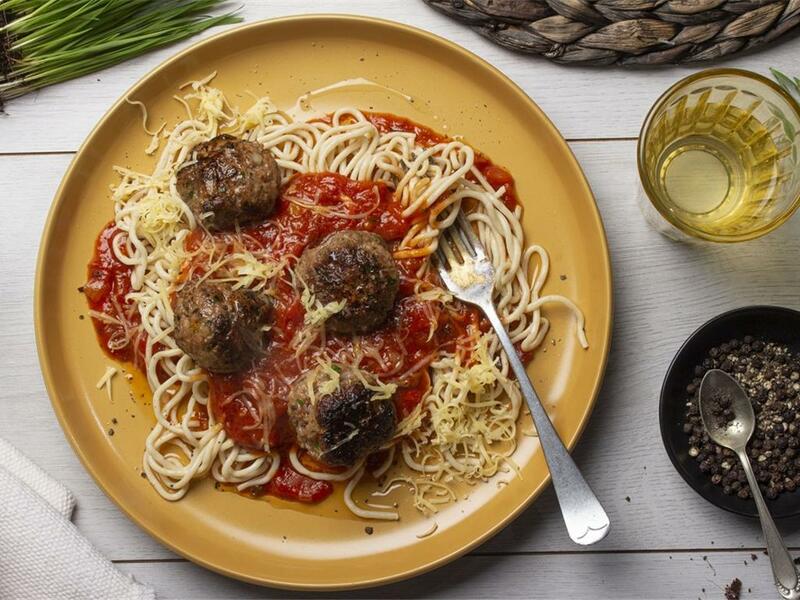 Nice to be able to eat traditional meat balls and spaghetti in a low carb way. " 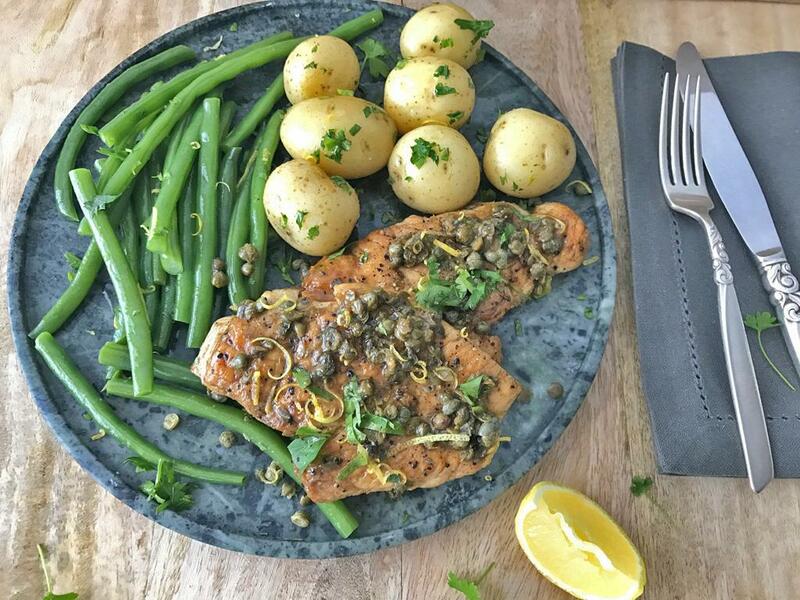 "Very yummy 😋 Perfect for those craving a bit of “pasta” while following a low carb diet. Loved it "